The summer of Valiant brought back four classic Valiant properties: X-O Manowar, Harbinger, Bloodshot and Archer & Armstrong. Now, I was familiar with three of those titles, but I have never read Archer and Armstrong. When I heard about the relaunch, I started asking around about it, and everyone told me “that was my favorite Valiant book!” So, after seeing some concept art, I decided to take the plunge and buy the first issue. So did this unknown to me dynamic duo make a new reader, or was it just another rehash? Story: So, the story of Archer and Armstrong goes back to ancient civilizations, with Armstrong being an immortal, and Archer coming from a sect devoted to killing the surly, unkillable man. Archer isn’t immortal, but he has the ability to mimic others abilities, which makes him a human weapon. But he is also an isolated young man: he knows nothing of the real world, save for what his parent’s sect have told him of the evils outside. There is no worst evil than Armstrong to them, as he holds the key to their plans. The story, by Fred Van Lente, is wonderfully orchestrated, introduces the world, the characters, and a story that I am dying to see finished. Art: One of my favorite modern day artists, David Aja, did the concept designs for Archer and Armstrong, but not the artwork. No, Clayton Henry has the full time art duty, and he shows that he is one of the best in the business. I have read a lot of the Marvel books that Henry provided the visuals for, and Archer and Armstrong is Henry at his pinnacle. The art is outstanding; as he brings the vibrant flare he has to the Valiant universe. Overall: So, what is my overall opinion of this debut issue? It was amazing, plain and simple. I never read a past Archer and Armstrong issue before, but I am tempted to now. Valiant relaunched the right way, with great writers and artists that produce an extremely high quality stories. This book is off to an amazing story, and I am definitely on board for the journey. 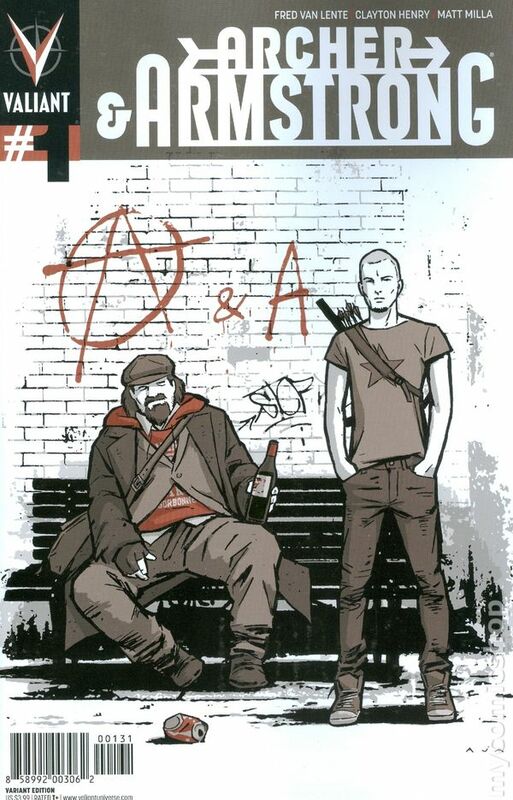 Highly Recommended, I give Archer and Armstrong #1 a perfect ***** out of 5. Previous The Dark Knight Returns Part 1 New Trailer!